A visit to the pyramids at Giza is a marquee item on many bucket lists. Indeed, the pyramids were one of the destinations that the dying old men visited in the crappy Jack Nicholson and Morgan Freeman movie that inspired the whole bucket list craze in the first place. To be sure, seeing the pyramids up close and personal is a surpassing experience (and one which is covered in my next post). But there’s much more to Egypt than those piles of limestone bricks in the desert. This is the first in a series of articles in which I’ll comprehensively recap my two week tour of a magical land that’s been around since the dim mists of recorded history. That tour took place in September 2012. (As sort of a prologue to the series, I wrote about how Egypt became country no. 25 on my World Karaoke Tour. Check out that article to find out what happened when I sang “Walk Like An Egyptian” in Egypt!) Today’s subject is Cairo, the capital city in which my adventure got underway. Future installments will cover the other checkpoints on my Egyptian itinerary: not only Giza, but also Luxor, Karnak, Dendara, Edfu, Kom Ombo, Philae, the Valley of the Kings, Aswan, Abu Simbel, Memphis, and Saqqara. And I’ll also write about my cruise on the Nile, that wonderful liquid highway by which I reached many of those immortal locales. Before I could explore all that history, I had to overcome fears stoked by a present-day crisis. Just days before I was supposed to be in Cairo, anti-American demonstrations had flared up at the U.S. embassy there. Some of the footage that the TV news channels were broadcasting looked pretty frightening. I wondered: should I reconsider my trip? Since you’re reading this article now, I obviously proceeded to go. And I was so happy that I did! The thing that can legitimately be deadly in Cairo is the traffic. Many of Cairo’s streets can be described as free-for-alls; even multi-lane highways often lack clearly delineated lanes, so drivers make their own lanes. It’s also not uncommon to see a major intersection without a traffic light (or at least without a functioning traffic light). Even the operational traffic lights are often regarded by drivers merely as “suggested” signals. As a result, cars and trucks are constantly jockeying for position, often with the aid of horn-honking. No wonder the website Expat Focus has stated that “[t]he single greatest physical threat while living in Cairo is the risk of being involved in a traffic accident.” And the lack of controlled intersections or cross-walks can make being a pedestrian even scarier than riding in a car. Crossing the streets often feels like playing a real-life game of Frogger, as you’re darting between vehicles and hoping not to be flattened before you make it to the other side of the road. The Egyptian Museum fronts on Tahrir Square — which, by the way, is actually a circle (a traffic circle, to be exact). Geometry aside, it became world-famous in early 2011 as the particular part of Cairo where over one million demonstrators massed, day after day, in an uprising against Egypt’s autocratic government. 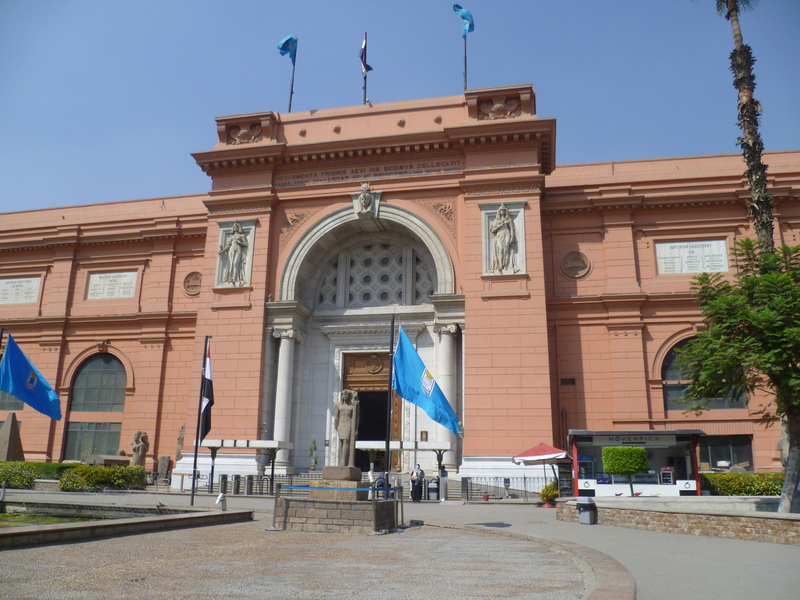 But when you step inside the Egyptian Museum, the convulsive events that unfolded just outside its doors are forgotten. The facade of the Egyptian Museum. You may be surprised to learn that the embalming techniques that the Egyptians refined to such a high art were not only applied to human beings. In the Egyptian Museum there’s a room displaying some mummified animals, such as crocodiles, baboons, and, of course, cats. The Egyptian Museum will soon be relocating to new quarters. A much larger building is under construction in the nearby city of Giza, adjacent to the pyramids, and is projected to open in 2015. But for now the museum is living out its final days on Tahrir Square. A vivid reminder that revolutions are violent things. I was told that this building was torched during the revolution last year. 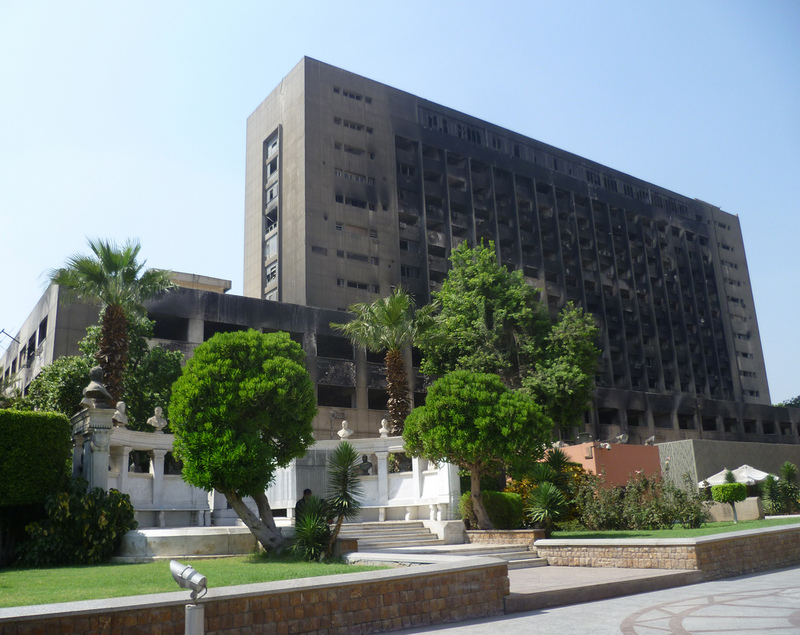 Its charred remains are a sobering reminder of the violence that broke out in Cairo very recently. Here’s something you don’t see in Manhattan: livestock being herded down a city street. 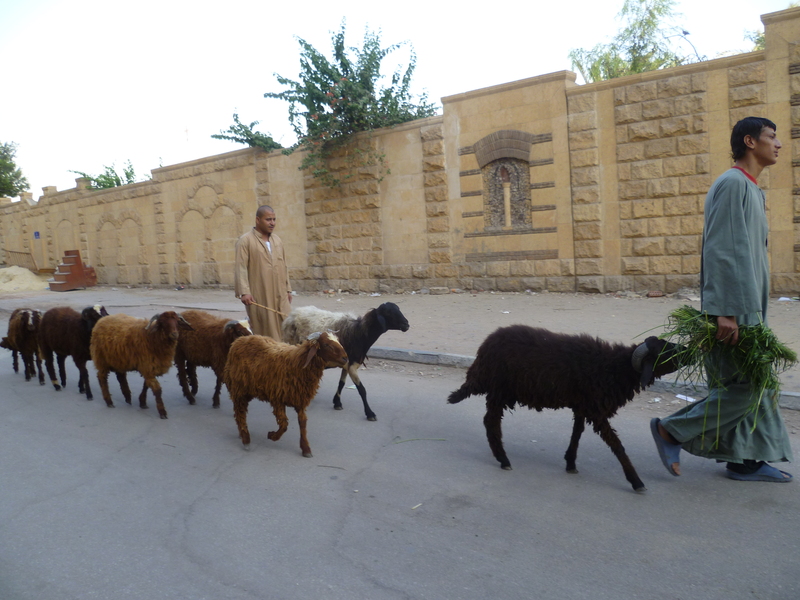 A herd of sheep being led through the streets of Coptic Cairo, just outside the souvenir store where I was scammed out of $20. All roads lead to Rome, even in Cairo. That fortress, despite its advanced age, appeared on the scene relatively recently in the context of the long sweep of the history of its location. The Roman outpost of Babylon sprang up during the reign of the emperor Augustus, around 30 B.C. ; but the story of human occupation of the area stretches back much further. Before the Romans arrived, what’s now Old Cairo had been part of the ancient Egyptian city of Heliopolis (known in Biblical times as “On”). Most vestiges of Helioplis have long since vanished; all that remain of it are scattered ruins comprising an obelisk, some granite blocks, a few ancient city walls, and the like. On the other hand, many well-preserved buildings dating back to medieval times can still be seen. Of course, religion played a pre-eminent role during the Middle Ages, in Egypt as elsewhere. 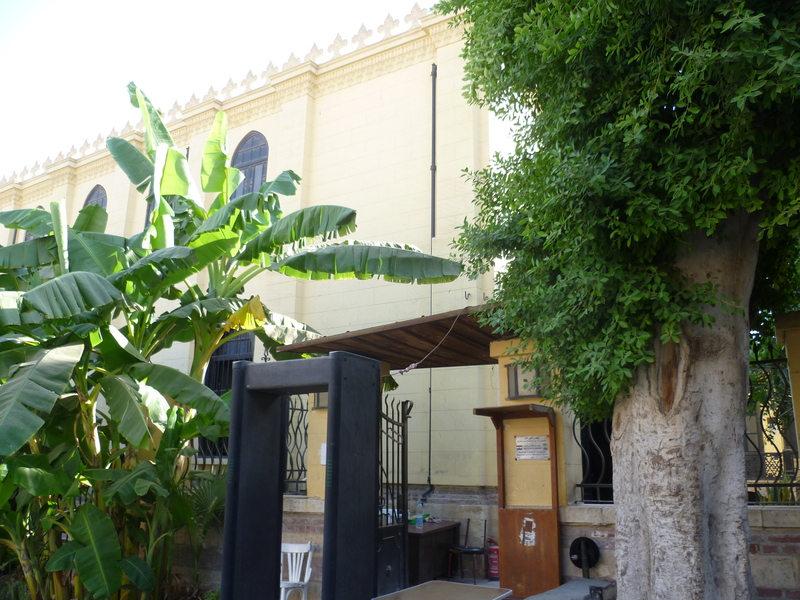 It’s therefore not surprising that among the most notable buildings in Old Cairo are a trio of houses of worship (a church, a synagogue, and a mosque, representing the three major religions that had their geneses in the Middle East). 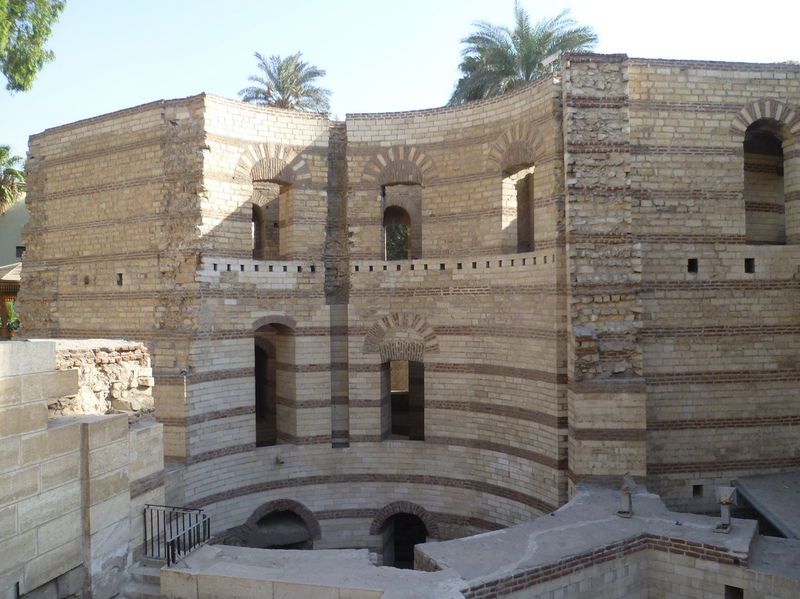 Each of these houses of God was its religion’s first centre of worship in Egypt, and is still used for prayer services today. Inside the chapel of the Hanging Church. Judaism is represented by the Ben Ezra Synagogue, alternatively known as the El Geniza Synagogue. Tracing its origins to the 9th century, Ben Ezra has a cool backstory. 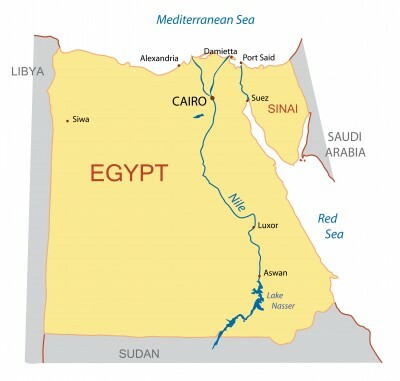 Legend holds that the ground on which it stands was the site on which the baby Moses washed up after his mother placed him in a basket and launched him into the Nile River. 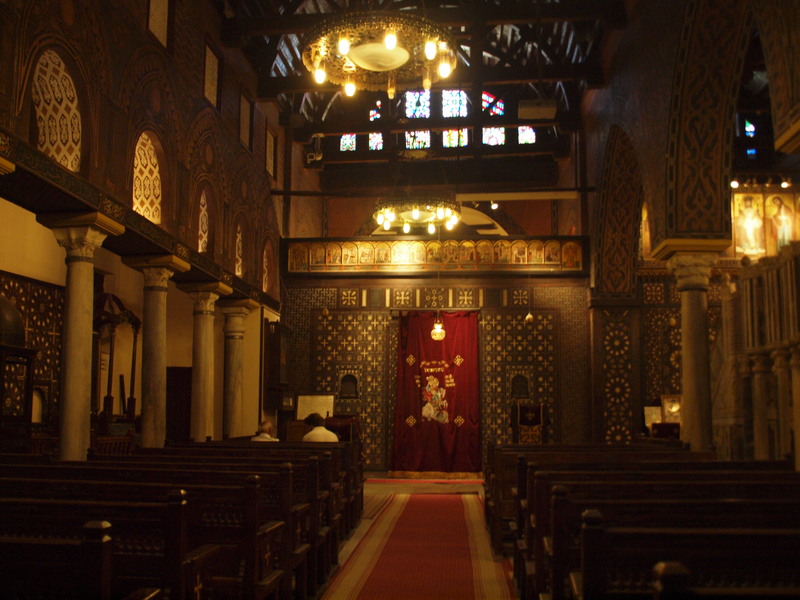 The Ben Ezra synagogue in Old Cairo has hosted Jewish worshippers since the 10th century. 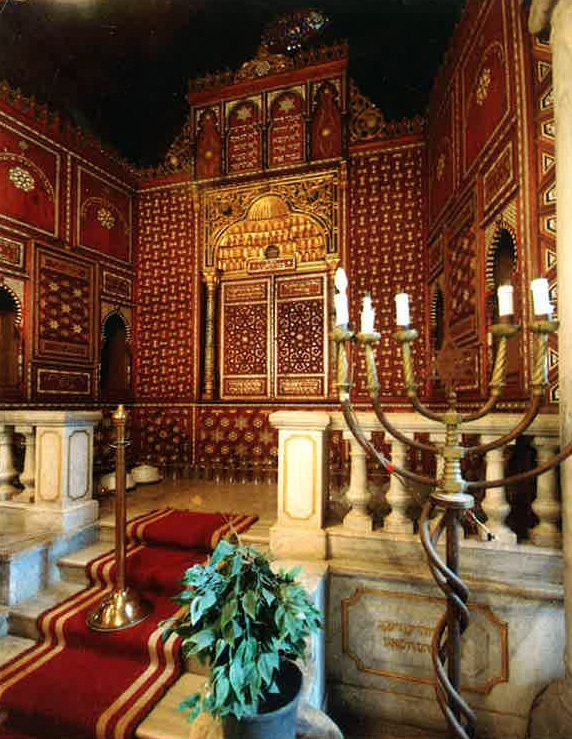 A postcard of the elegant interior of the Ben Ezra synagogue (I wasn’t permitted to take photographs inside). Inside the Mosque of Amr. My most memorable incident in Old Cairo was timeless, in a way; it was there that, on my second full day in Egypt, I fell prey to one of the dreaded “ali babas.” That term of opprobrium is a reference to the title character of one of the stories in the anthology One Thousand and One Nights, whose name has become an eponym for thievery. Egyptian merchants who try to cheat, or take advantage of, tourists are referred to locally as ali babas. My run-in with an ali baba unfolded as follows: I’d been lured into one of the souvenir stores in Old Cairo. I ended up inside after the employee on duty beamingly told me that his wife had just given birth to twins. The proud papa’s name, I would later learn, was Mohammed. I bought a t-shirt from him, and while I probably overpaid for the shirt (as I was still getting the hang of the haggling thing that’s so important when doing business with an Egyptian vendor), that purchase was admittedly a voluntary transaction on my part. Mohammed, however, was not satisfied with the funds he’d already extracted from me. He told me that he wanted some American money. (The reason for this desire was never really made clear to me, although U.S. dollars are widely accepted throughout Egypt.) He asked for fifty bucks, offering to trade me the equivalent in Egyptian pounds. Most of my two-week tour of Mohammed’s country was still ahead of me, and Egyptian pounds were therefore going to be far more useful to me than U.S. dollars in the near future. Thus, I readily agreed to convert my dollars into pounds. In what would prove a fortunate break for me, the only American currency remaining in my wallet was a twenty-dollar bill; if I’d been carrying the full fifty dollars Mohammed had requested, I would have ended up being swindled out of more money than I actually was. We agreed that Mohammed would convert my twenty bucks into one hundred twenty Egyptian pounds. (At the time, the exchange rate was about 6.1 Egyptian pounds per dollar. To provide for nice round numbers, I agreed to a rate of exactly 6 to 1.) After I handed Mohammed my Andrew Jackson, he gave me three bills totaling 120 pounds: a pair of fifty-pound notes and a twenty-pound note. No, Mohammed didn’t slip me counterfeit money, if that’s what you’re thinking. What actually happened was more creative on his part. His ingenuity wasn’t revealed to me until a taxi dropped me off at my hotel and I attempted to pay the driver using some of the Egyptian currency that I’d just received from Mohammed. The cabbie angrily refused to accept my banknotes; I couldn’t figure out why my money was no good with him. The language barrier didn’t exactly help in resolving the impasse. Finally, a bellman from my hotel approached the taxi, examined my money, and explained the situation. Mohammed hadn’t given me Egyptian pounds; he’d slipped me Egyptian piastres, each of which is worth 1/100 of a pound. (From what I’ve been able to gather, piastres are no longer issued by the Egyptian government, but still remain in circulation. And they come in paper form just like pounds do.) Bottom line: in exchange for $20, the merchant had stuck me with 120 piastres, which were worth a grand total of about 20 cents. 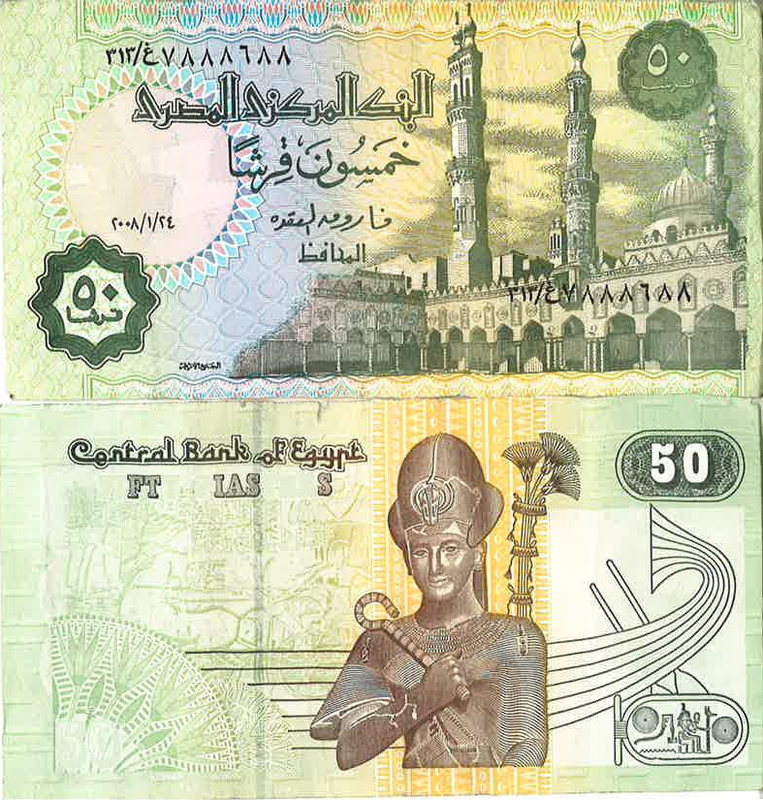 The front and back of an Egyptian 50-pound note. The front and back of an Egyptian 50-piastre note. If you look over these two types of Egyptian paper currency, you’ll notice many distinctions, most obviously in background colour. 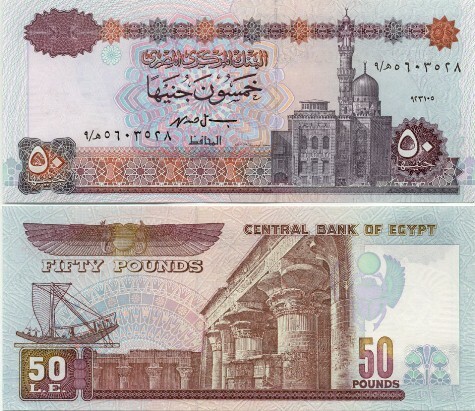 But it’s easy to notice such details when you’re actively seeking them out, and when you know going in that there’s an Egyptian banknote in circulation that comes in a denomination of “50” but is worth only one percent as much as a 50 pound note. When I was doing the exchange with Mohammed, I was only scanning the number on the upper right-hand corner of each banknote, to ensure that those numbers added up to 120. Since the numbers did add up, I had no reason to suspect that I’d been duped. It bears mentioning, of course, that things could have been much worse. Losing $20 isn’t the end of the world, especially for someone fortunate enough to travel to Egypt in the first place. Plus, I wasn’t physically harmed. 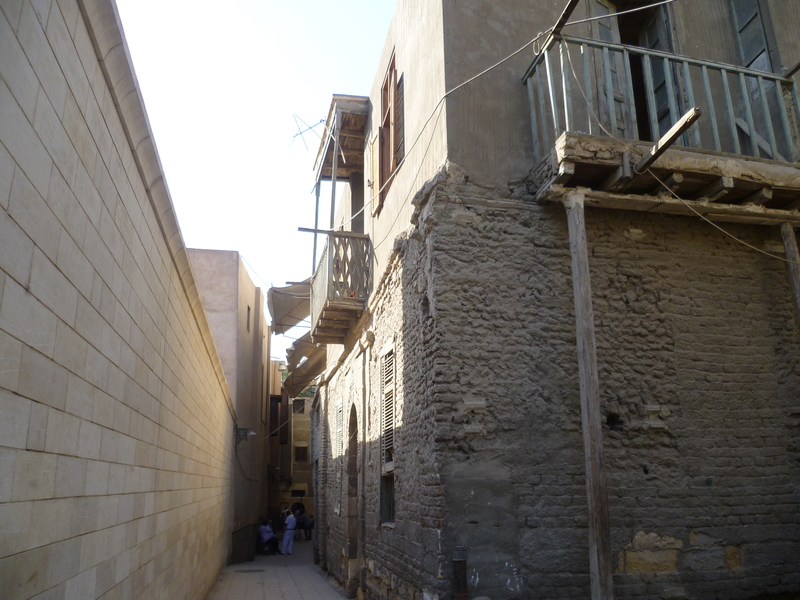 One last point about Old Cairo: that part of town wasn’t on the itinerary of my group tour. However, by arriving in Cairo a couple of days in advance of the start of my tour, I was able to fit it in on my own. Package tours are controversial among travel bloggers, partly because you lack control over the tour organiser’s choice of destinations. But if you allow yourself extra time beyond the endpoints of the tour, you can enjoy all the benefits of a group tour while still ensuring that you don’t miss out on any points of interest to you. Another venerable section of Cairo that, like Old Cairo, dates to the Middle Ages is the Saladin Citadel (usually just called the Citadel). As its name implies, the Citadel is a fortress. It was created during the Crusades by the legendary sultan Ṣalāḥ ad-Dīn Yūsuf ibn Ayyūb, known to the Western world as Saladin. 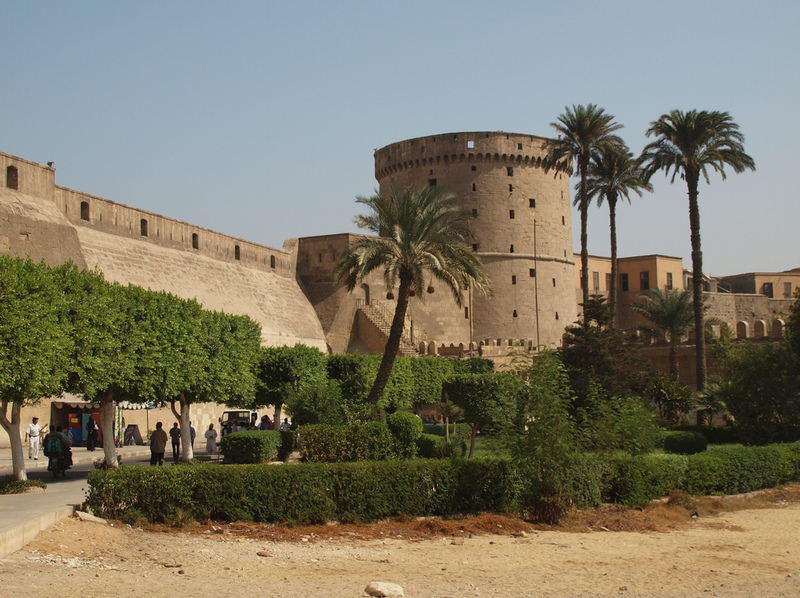 Situated near the geographic center of Cairo, the Citadel sits on high ground like a good fortress should. It’s thus known for vantage points that provide panoramic views of the surrounding city. The tower of Cairo’s Citadel. A view from the Citadel on a typically hazy Cairene morning. Within the walls of the Citadel is an architectural masterpiece that’s much younger than the Citadel itself but has a beauty for the ages. Cairo has been called the “city of a thousand minarets” due to its abundance of Islamic architecture, including approximately 100 mosques. 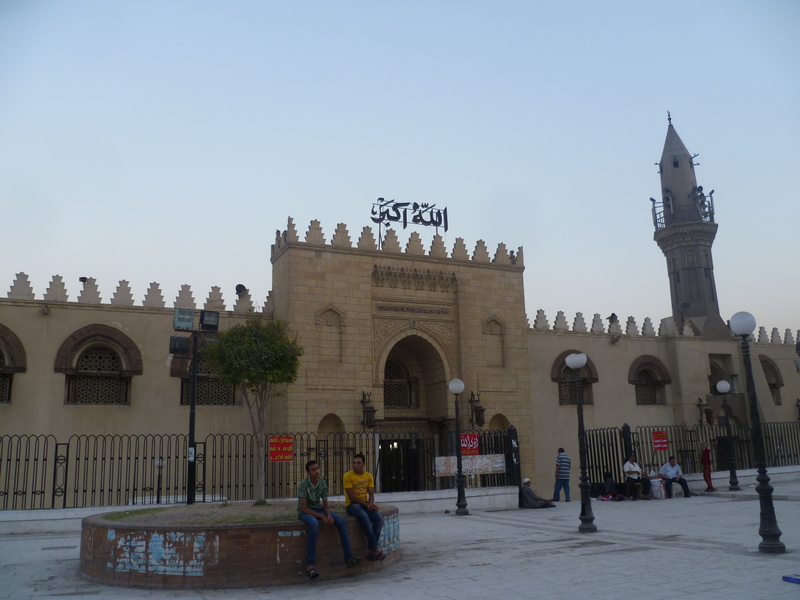 Perhaps the finest of those mosques is the Mosque of Muhammad Ali Pasha, also known as the Alabaster Mosque (so-called because its façade is extensively clad in that white mineral). Standing at the highest point within the Citadel, it was built during the rule of Muhammmad Ali (ruled 1805-1848), the last king of Egypt. (Ali had it built in memory of his son, who had died at age 22.). Ali’s great legacy was constructed in the Ottoman style, and its outward appearance is more than a little reminiscent of some of the great Turkish mosques such as the Hagia Sophia. The Muhammad Ali Mosque in the Citadel. This mosque is The Greatest! 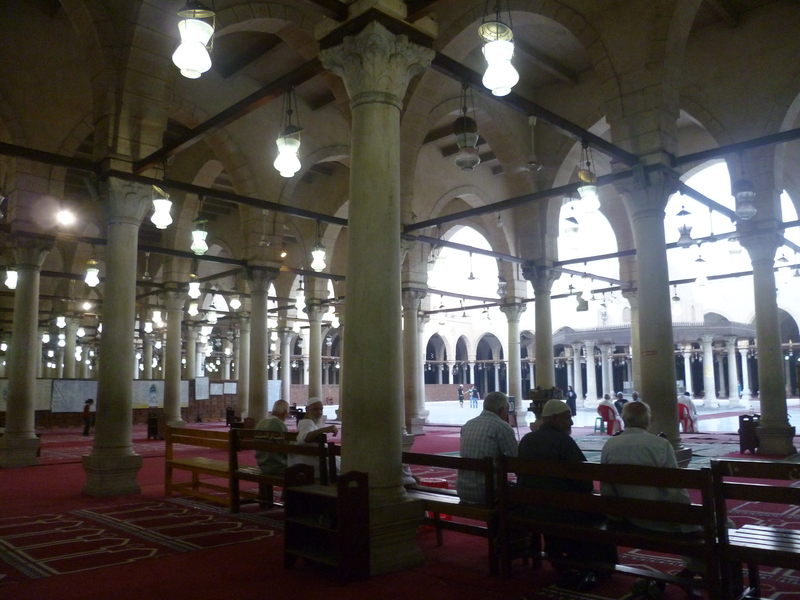 The sumptuous interior of the Alabaster Mosque. 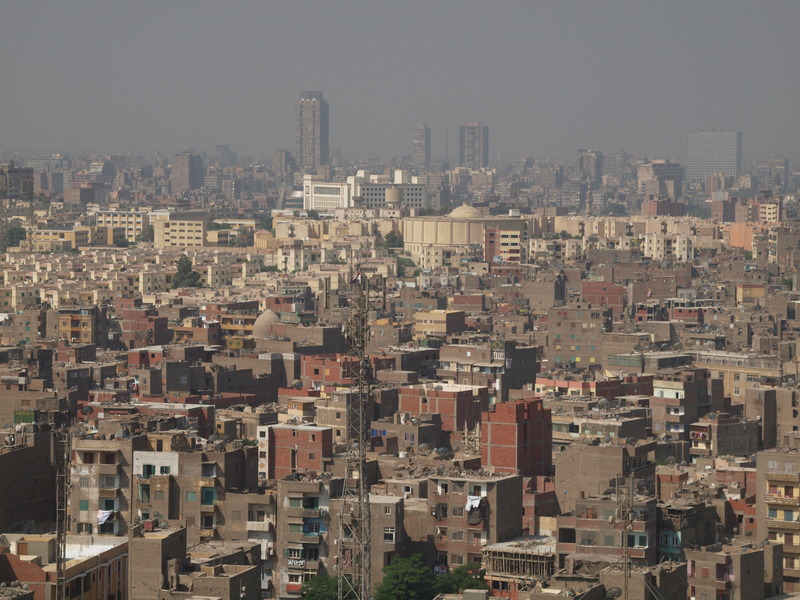 Due to its commanding position, the Alabaster Mosque is visible from many points throughout Cairo. With its distinctive dual minarets, its profile is one of the city’s iconic images. While I enjoyed terrific meals throughout my stay in Egypt, two of my dinners in Cairo especially stood out, for different reasons. The other memorable repast was a dinner at a restaurant in downtown Cairo called Abou Tarek. There, you’ll find only one entree on the menu: a traditional dish called koshary, the ingredients of which include lentils, rice, chickpeas, pasta, tomato sauce, and fried onion. (The exact mix of ingredients may vary depending on where your koshary is prepared; for example, some restaurants omit the chick peas). 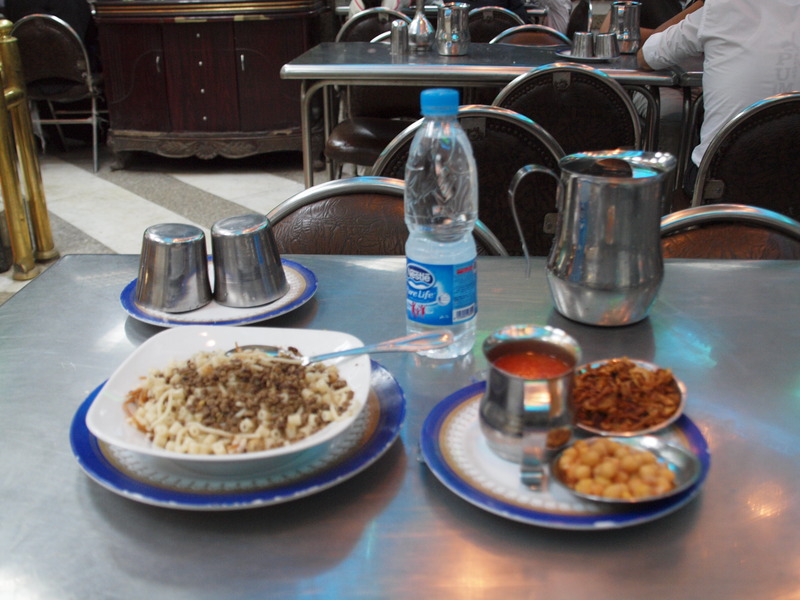 Koshary is often considered Egypt’s national dish, and koshary-only eateries are common in Cairo and throughout Egypt. 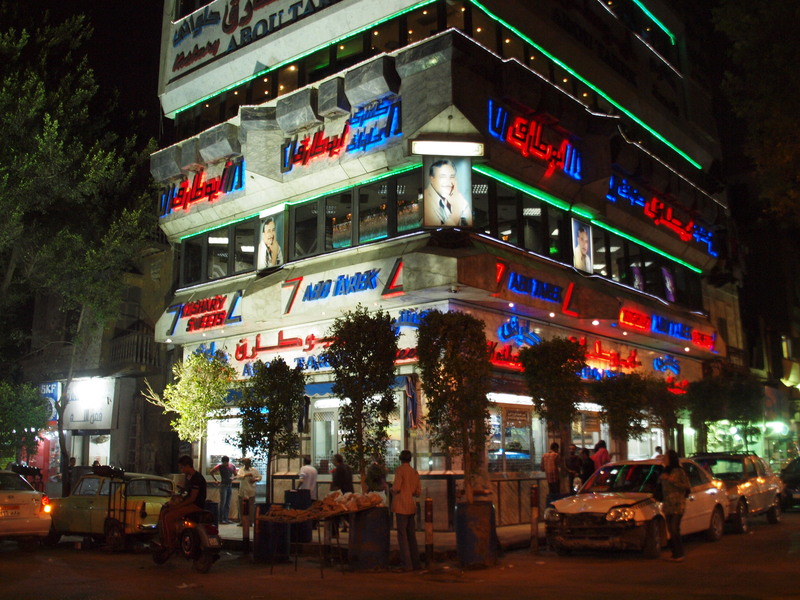 The exterior of Abou Tarek, a famous koshary establishment in downtown Cairo. 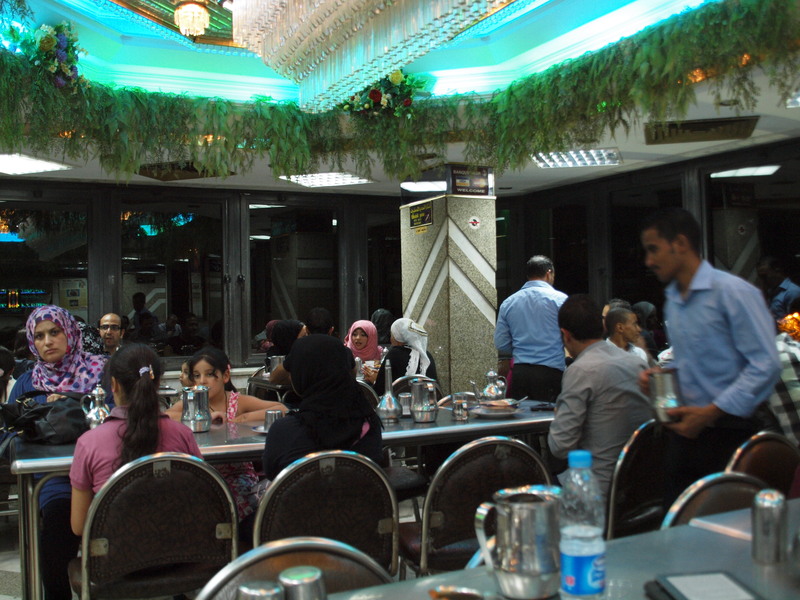 Patrons enjoying a repast of koshary inside Abou Tarek. This is how the koshary was brought to my table. I was the only Westerner in Abou Tarek (although the general decline in tourism to Egypt may partially account for that, since Abou Tarek is widely mentioned on travel websites. And indeed, the restaurant had come to my attention when an American friend recommended it to me.). So I knew that I was getting an authentic Egyptian dining experience. Abou Tarek was also amazingly inexpensive; my serving of koshary cost ten pounds, which was equivalent to slightly more than $1.50 US. For another 3 pounds (roughly 50 cents US), I added a bowl of rice pudding for dessert. That’s a complete meal for two dollars! (My bottled water added another 50 cents to the check.) That kind of value is hard to beat. Equally important, the koshary tasted really good. 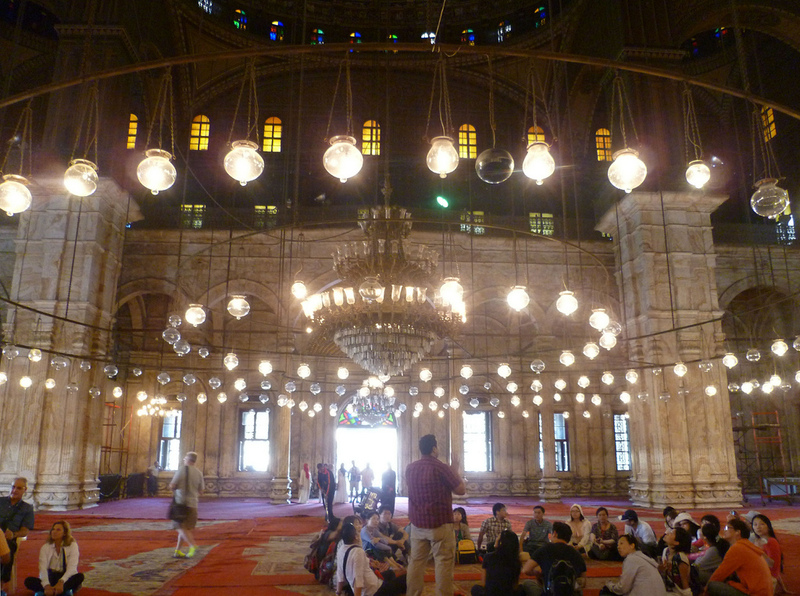 Before I spent time in Cairo, I didn’t know what to expect from it. I’d regarded it as a placeholder — the city where I’d start out before hitting up the really glamorous attractions like the pyramids and the Valley of the Kings. 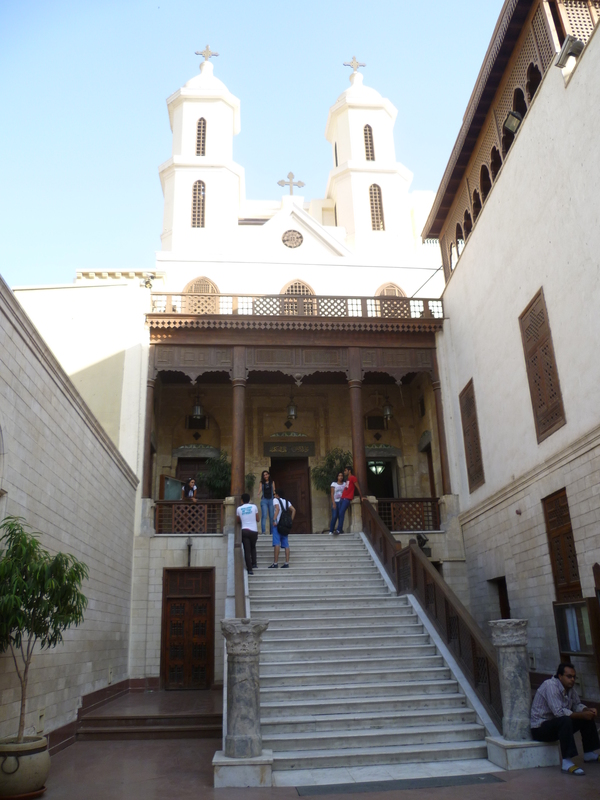 But the history and culture made Cairo thoroughly enjoyable for me on its own merits. 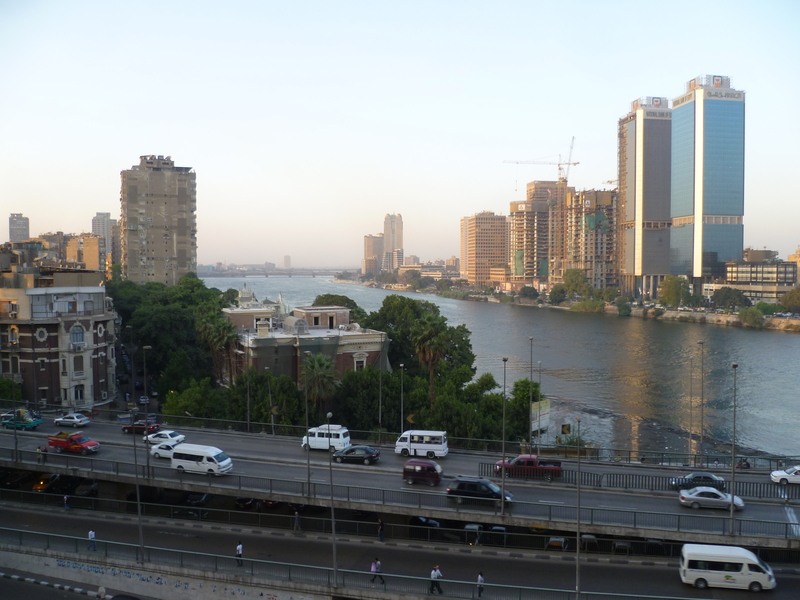 This was the view from my hotel room, overlooking the Nile, during my final two nights in Cairo. @Toos: Thanks, I’m glad you liked the article! It was fun seeing a lot of these places with you and the rest of our group! Very well written, Harvey. Very creative and entertaining. I wish I had the time to write something down like that, for memories sake, as you forget all the things that happen to you on a trip like that. @Shane: Thank you for the kind words. 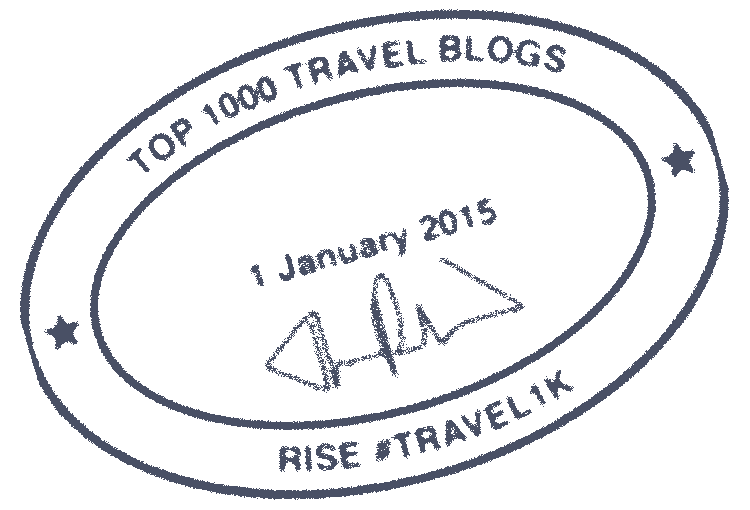 It did take me a really long time to get this post written. And yeah, that’s one of the reasons I blog — to help preserve the memories of the great times I have on trips like this one. I have always wanted to visit Egypt and Cairo. The medieval side is particularly intriguing. I have had some reservations though specifically when it comes to being scammed or hassled. It sounds like you were pretty tolerant of Mohammad. I would lack the patience but I suppose it happens! @Suzy: I wouldn’t say I was tolerant of Mohammed having scammed me; the problem with was that by the time I found out I’d been played, it was too late, and I was about to join my tour group. And when I was finally able to return to the store ten days later, Mohammed was gone for good. Also, I wouldn’t want anyone to be put off from visiting a wonderful country just because scams like “piastres for pounds” exist. In most stores and souvenir stalls in Egypt, the worst you’ll encounter is pressure to buy something (and they can be relentless); but you can resist that. Wow, what a post. Love the photo of the citadel especially. And the goats. How to make goats follow you in a straight line? Carry a wad of leaves. That’s definitely not something you’re going to learn on most city streets. Great photos – brought me right back to Egypt! I’ve heard of Abou Tarek and would love to try their version of my favorite dish. 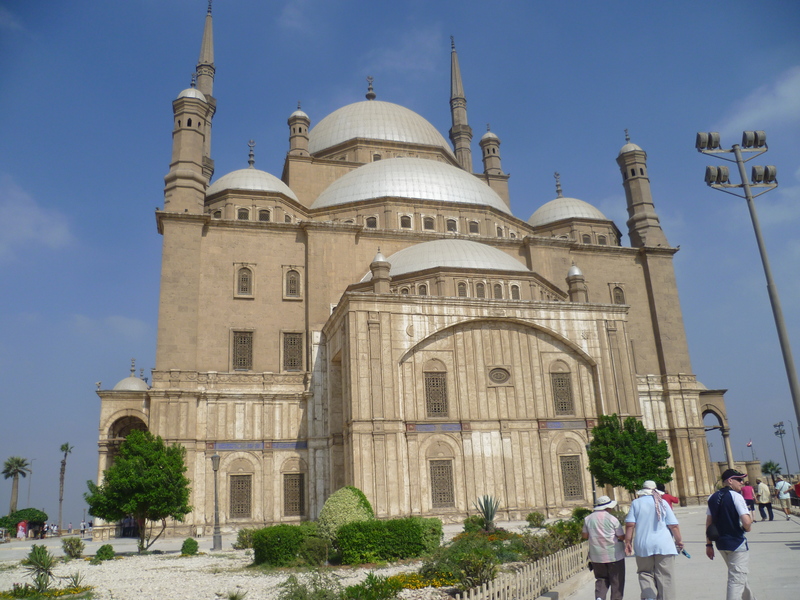 Looks like we saw a few similar sights, except I didn’t make it to this church, we went to the one in garbage city instead, and rather than visit this mosque, we went to Sultan Hassan mosque. But, still great overall! I hadn’t heard of the garbage city when I was there (It’s come to my attention subsequently). That would have been interesting to see, albeit sobering and sad. It’s a side of Egypt I didn’t really see. You managed to do a lot in Cairo. I would love to wander the narrow streets of Old Cairo!